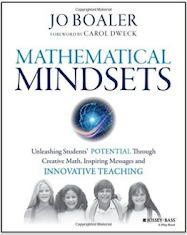 Chapter 3 was my favourite in the book because we don't often consider math to be an aesthetic subject that inspires creativity and beauty as described by Jo Boaler. I'm hoping that our discussions for chapter 3 can focus on making some connections to our personal and professional lives. 1. Do you consider math to be something that is beautiful? If so, how and why? Would you describe math as beautiful to your students and their families? How might you do so? 2. Have you ever engaged children in math experiences that inspired creativity and aesthetics? Can you give an example with photos or perhaps a link to a blog entry that delves more deeply into this idea? 3. How has this chapter inspired you to do things differently in your classroom in the new school year? Are you considering a deeper connection between math and artistic centres and experiences in your indoor and outdoor classroom? I have always loved math.. and when I went to school it was certainly all about the fastest calcuator etc.. before calculators were used! I believe in giving open questions for students rather than a sheet full of calculations. When I do my weekly homework page, I include math to be done during the week and in that, I have the students find things at home related to the current math topic, or play a game with parents or siblings. That way parents see what their child can figure out. When we work on math in class, very often my students ask, "Was that math?' ... when I say it was... they are quite surprised since they have been used to simple pencil and paper tasks. I feel it is important to get my students to love math!!! By making it fun we can make them love math! This chapter really resonated with me. As a student, I always struggled with math. When I was in grade 3, I vividly remember having "Mad Math Minutes" in which problems would be written on the board, and we would be given a set amount of time to complete them all. As my classmates around me would finish, they would cheer and clap, seemingly to try and encourage others, but this only stressed me further, causing me to lose my focus, and I never was able to complete all of the questions. I was always embarrassed because to me, this meant I was a failure. That same year, as I struggled with other math concepts, the teachers realized there was something more to my struggles. I began working one on one with a remedial teacher - only when I was given ample time and no distractions was I able to complete all of those Mad Math Minute questions, and I got every single one right. I knew then that I was capable, and I could succeed, but I didn't do it in the same way as others. As a teacher, I try very hard to encourage my students to explore math and enjoy it, but I still feel some of my own insecurities sometimes creep back in. This chapter has inspired me to explore patterns in nature more in depth next year - I was thinking of introducing that math concept at the beginning of the year, when we spend so much time getting to know our students and establishing routines. I think patterning, especially exploring patterns all around, lends itself very naturally to most students, and it would be a good stepping off point for other concepts. Patterning is a great startup focus since the students can have fun with it while learning.. However, math can be made fun for the students who have an open mindset. Those who can use the manipulatives and relate the math they are learning to real life, are going to learn and have fun doing so. This past year in my grade 1-2 class, we DID fractions for 2 weeks. The students learned from each other and not one 'worksheet' was given - they learned all about fractions for grade 2 - halves, quarters, parts of a whole and parts of a set. I was able to determine what they knew from my observations (by the way, I've been teaching for 17 years). After many of our math classes, when I can see what the students have learned, some will ask - why we missed math today. They are amazed when I say we had just completed it. Of course, some of the students want, even crave those worksheets to 'show what they know'. I'd been off til February last year, due to my husband's illness. The sub for me was really into worksheets full of questions.. for class and homework. A couple of the girls who think they are really 'smart' talked about those worksheets. This coming year I'll have most of the same students since I am slated to teach grade 2-3. I'm hoping to begin the year teaching the students about that open mindset - especially those who think they are bored and not learning math (because they feel they know it). One of my colleagues who teaches grade 1 did a fraction party with her class this year. They had been exploring fractions, and in order for the students to make a real-life connection, they brought in foods that they could divide into fractions and had real discussions about which fractions were greater and less, etc. The students loved it.But I do agree - so many students (even in kindergarten) will ask/seek out worksheets because they associate that with "school" and "learning". I just found an interesting piece on getting parents to see the beauty of Mathematics. So often parents feel they struggled in math in school and pass that on to their child. From his article, I read of a lot of different ways we can let students - and their parents - see the beauty of mathematics around us in our lives and in nature. Sounds interesting. Do you have a link to the article? I tried searching for it, but not sure I found the correct one. Truthfully, I never thought of math as something that is beautiful until I attended OAME 2016 and listened to Robert J. Lang share his passion for origami. Next year, I look forward to combing the playground with my grade 1/2's and discovering patterns in nature, as well as creating works of art/math with pinecones, rocks, etc. A quick google search "math in nature" pulls up some gorgeous images to share also. http://www.upworthy.com/math-is-astoundingly-beautiful-and-weve-found-the-video-to-prove-it-4 A great video to share with parents. I would also like to share with parents the 4 misconceptions about math that Boaler summarizes in her conclusion. Having been away from classroom teaching for 9 years, I have the luxury (and nervousness) of starting fresh. I am still in the process of figuring out what my program will look like, but I am excited to meld many subjects, including math & art, with an inquiry based, play based approach. I am planning to have a Wonder Wall in my classroom where students pose questions. From there, we will formulate a problem, solve it, and then check to see if the original question was answered. Wolfram will be pleased, as there you have the four stages of working on mathematics. Honestly, math has become something more beautiful to me since becoming a Kinder teacher. We look at patterns in nature, create art with 2D and 3D shapes, patterning with loose parts...The connectedness of art and math is a really beautiful thing to explore and I hope to do more of it this year. I think sharing photos and describing the connections to math is one of the best ways to help parents understand and see the beauty themselves. Over the years my passion for math has developed. The best part is that my students also become so excited about math. The realization for them that we really do math throughout the day is exciting. Together we tackle problems that I always frame as a real life problem. "Can u help my mom she needs ..." They get so engaged in the idea it's exciting to watch. As I read this chapter what resonated with me the most was the need for "wait time". When my colleague first introduced me to this strategy I realized how uncomfortable it made me fell. But then I watch what happened by using it. Students who were often silent in discussions began to raise their hand more often. Students were reminded "don't take away his thinking" (when they would blurt out answers). After reading this chapter I have a new perspective on how it must feel for the student. They know they can finish thinking and take their time to share. They realize there thinking is as important as the student next to them. In reading responses, and talking to many adults over the course of my lifetime, I think I am one of the lucky ones that did have math presented to them as beautiful and natural... Math teaching can come up in many areas of the day - outside for a walk, building with blocks, listening to music, doing art, etc. I think in order to make math meaningful, kids (and adults) need to see it in other places aside from "math class". Taking a math walk outside can help students she shapes and patterns in a natural environment, and open discussions about why things are shaped the way they are, and what would be the advantages/disadvantages of that shape. Building with blocks allows students to explore the various shapes, what they do, how they sit/roll/interact with other shapes. Awesome relationships to science can be discovered when trying to make a stable tower/building! Water play is mathematical - measuring, sink/float activities, water increase when placing objects into water, etc all allow students to see real-life applications of a concept. Play with pattern blocks is also a favourite - not only making beautiful creations out of them, but the relative relationship between the sizes (6 green triangle make the hexagon, etc). It is so essential that the students get a chance to play with the relationships between things!! Books that explore and play with number relationships are great!! 1) I do consider math to be beautiful. This realization only happened once I started listening to my students and my own children describe things in their world that were math related. For example; patterns in nature or shapes in a drawing. 2) I can not think of any specific experiences I have offered, recently, with math and aesthetics but when we were creating pastel and water color paint snowflakes last year I had a few students describe their snowflakes using math words (“I see squares and circle”). We also had a lot of math brought out through loose parts play. I am excited to provide more chances next year for math to be seen in more of an artistic nature. 3) One of my colleagues does a “math in nature” activity once a week where she shows a picture (sometimes a building, sometimes a forest) and student will then discuss where they see math in the picture. This is a task that I would like to try next year. I certainly never saw math as beautiful when I was a student. I liked it but saw it as a race, challenge, puzzle. I still like the metaphor of a puzzle but I prefer her take that the real challenge in math is to come up with a question. I plan to focus on that as a learning goal for my students. What other question can you come up with? I had never heard of the golden ratio until two years ago and find that it really opens students minds to the wow factor of mathematics and nature and the world around us.